If you have ever attempted to write a little WinForms or WPF UI using PowerShell you have no doubt run across a method like add_Click() e.g. This might be a bit confusing if you are looking at C# examples or even the MSDN topic on a Windows Form Button. It says the event name is simply “Click”. What is going on here? When C# and .NET were first introduced they were inspired by Java but they also added some features Java didn’t have. Two of these features were language level support for properties and events. Two concepts borrowed from Delphi which isn’t too surprising given that the chief architect of C#, Anders Heljsberg, came from Borland where he was the chief architect of Delphi. Anders’ contributions date back to the introduction of Turbo Pascal which I thoroughly enjoyed during my college days. As an author of a type in .NET this is great because I can check to see if the value is different and only if it is different, perform some application specific logic. For instance, WPF apps often need to let UI elements know when the value of the property has changed. 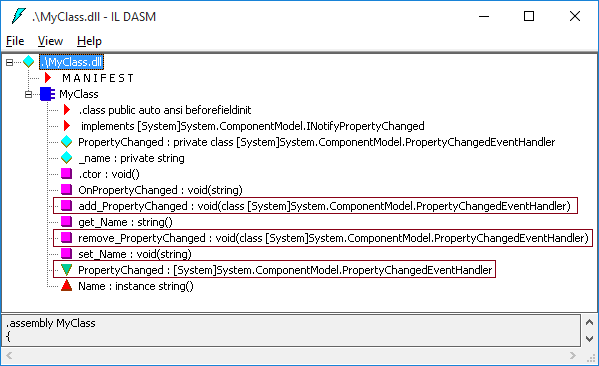 WPF’s data binding relies on this behavior and when it has been notified of a change to a property, it can get the new value for the property and update the UI automatically. Properties in .NET give us the necessary hooks to do this. Note that in the code above, _name is a field. If I had made that field public, then a user of the type would have direct access to the field. They could get or set the _name field and the class would have no way to know the field has been accessed or modified because there is no way to inject code during the read or write of a field. What C# and VB compile down to is known as Common Intermediate Language. 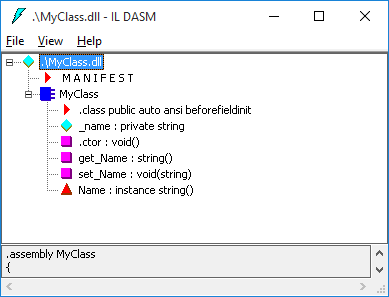 This is typically what a .NET executable or DLL contains. It is an architecture neutral representation of compiled source code that is not directly executable. It has to be “just in time” compiled using a jitter (just-in-time compiler) or “ahead-of-time” compiled using a tool such as ngen.exe or the new .NET native compiler. The Name property is simply a pointer to the compiler generated methods get_Name() and set_Name(string). This is where the actual implementations of the property getter and setter reside. Keep in mind that the C# source “obj.Name” is converted into a call to obj.get_Name() and obj.Name = “John” is converted to a call to obj.set_Name(“John”) at the CIL level. At first glance this seems like it would be a minimal convenience but it turns out to be huge for C# and .NET’s usability IMO. Unfortunately, PowerShell does not support .NET event subscription syntactical sugar like C# and VB do. That said, you’ll see that there is an easy workaround. You could also argue that for most scripting scenarios you don’t use .NET events. However, as soon as you want to build a UI, either with Windows Forms or WPF you’ll be using events, perhaps a lot. It just references the add_PropertyChanged and remove_PropertyChanged methods. The actual implementation of event subscription and unsubscription are done in these two methods. The same syntax += in PowerShell does not work for event subscription. Fortunately the syntactical sugar is not required, we can just call the add_PropertyChanged() method directly. The same goes for remove_PropertyChanged(), instead of C#’s -= syntax, if we need to unsubscribe from the event. It works. It perhaps isn’t as elegant but more importantly I think the issue is lack of documentation and examples that use an event’s add/remove methods. This is because the vast majority of .NET samples on the internet are in C# which are going to use the += and -= syntax.. It leaves the average PowerShell scripter scratching their head about why the C# += syntax doesn’t work. And wondering what is up with this weird add_Click() method in the PowerShell script examples that show how to use Windows Forms. Hopefully, if you’ve made it this far, you’ll have a good handle on these compiler generated methods for subscribing and unsubscribing to events. This entry was posted in .NET, PowerShell. Bookmark the permalink. Thanks a lot for this very,clear article. Thank you for taking the time to explain this, Keith. Finding an explanation to this took a bit of digging!